During the National Day Rally 2016, ElderShield is highlighted as the “one remaining piece to strengthen” in our social safety net. 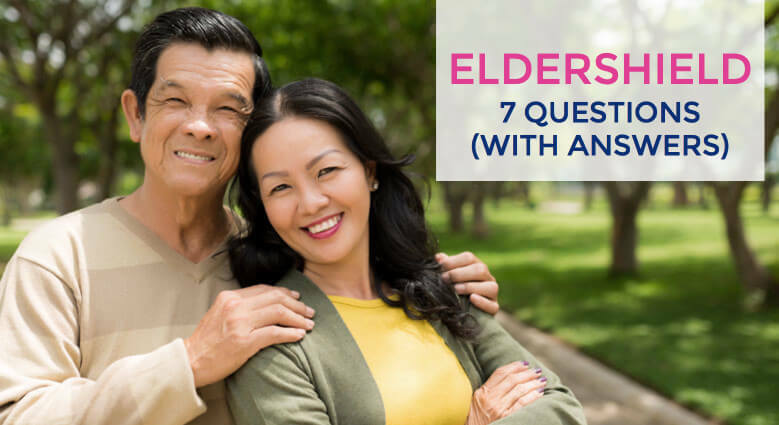 What exactly is ElderShield and why does it play an important role in taking care of us? Let me answer these 2 questions with 7 more questions (with answers of course)! 1. Do I have Basic ElderShield? As a Singapore Citizen or Permanent Resident who is a CPF member with Medisave Account, you will be automatically covered under Basic ElderShield when you reach the age of 40. There are currently 2 schemes: ElderShield300 and ElderShield400. ElderShield300 was first launched in September 2002 and provides a monthly payout of S$300 for a maximum of 60 months (5 years). ElderShield400 came about after the ElderShield reform in 2007 and provides a monthly payout of S$400 for a maximum of 72 months (6 years). Singapore Citizens and Permanent Residents who joined ElderShield on or after 30 September 2007 will be under the ElderShield400 scheme. 2. How does ElderShield work? When an individual is unable to perform at least 3 out of 6 of the Activities of Daily Living listed below, even with the aid of special equipment, and always require the physical assistance of another person throughout the entire activity, he or she is considered to have severe disability. Under such circumstance, a claim for the monthly cash payout can be made under ElderShield. 3. How much is my ElderShield premium and how can I pay for it? Your premium is based on your entry age when you joined the scheme and does not increase with age. The premium can be paid using your CPF Medisave funds. 4. Is Planning For Long-Term Care Important? Long-Term care refers to care which is required by individuals with chronic medical conditions or permanent disabilities. Long-Term care encompasses medical and social services which support the needs of those who cannot take care of themselves. This ranges from institutional care in nursing homes and hospices, to home medical, home nursing and home help service such as provision of meals, upkeep of personal hygiene and housekeeping. With an ageing population, longer life expectancies and higher incidence of chronic disease regardless of age group, the demand for long-term care is increasing. Thus, the cost burden on individuals and families will also rise. According to Aviva, stroke and heart attack are amongst the top causes for Singaporeans needing long-term care. Based on a news report on 4 Apr 2016 by Channel News Asia, around S$90 million has been paid out since ElderShield was launched in 2002, with about 12,500 successful claims. 5. Does your Basic ElderShield provides adequate coverage for your Long-Term Care Needs? Now, imagine if today you are the sole breadwinner of your family and had lost your income source due to not able to work as a result of being severely disabled, would a monthly payout of S$300 or S$400 be sufficient for your out-of-pocket long-term care expenses, and not forgetting your ongoing household expenses and financial liabilities e.g. loans? Aviva’s Long-Term Care Study 2011 showed that claimants on average required about S$2,150 per month to pay for domestic helper or nursing home, transportation to and from the hospital for treatments or physiotherapy, mobility aids, as well as daily expenses and bills. Apart from being costly, long-term care can also be for a prolonged period of time. A Department of Statistic Singapore paper published in 2011 showed that, in Singapore, more than a third of caregivers (37%) had been providing care to their recipients for over a decade. Let’s look at the respective cost in the various aspects. You may be discharged from the hospital but that doesn’t mean you have fully recovered. You will need additional inpatient care such as therapy and rehabilitation, nursing care and the need of caregiver to provide help with daily living. The estimated cost is around $8,000 – $9,000 a month. There are government subsidies between $1,800 to $7,000 a month which you can apply for. These are for patients who cannot take care of themselves in their own home and need significant assistance in daily assistance. It costs around $1,200 – $3,500 a month. You can tap into government subsidies and Medifund for selected homes only. Those that require temporary help can apply for respite care costing around $100-$150 a day. It costs around $7,000 a month payable via Medisave (selected hospices only). 6. Do you know how to buy more long term care insurance using your medisave? You are able to utilize a maximum of S$600.00 (per insured person per policy year) from your CPF Medisave Account for upgrading of your Basic ElderShield to ElderShield Supplement. Similar to the Basic ElderShield, the premium for ElderShield Supplement is based on your entry age and does not increase with age. In other words, the younger you are when you upgraded to ElderShield Supplement, the lower will be your premium. 7. I already have Total and Permanent Disability (TPD) coverage in my whole life insurance, do I need ElderShield Supplement? Currently, insurers in Singapore provide TPD coverage only up to the age of 70 for their whole life insurance. On the other hand, both the Basic ElderShield and ElderShield Supplement provide lifetime coverage against severe disability, providing insurance coverage when a disability occurs later on in life(e.g. age 75). Unless you are confident that your savings is enough to pay for the high cost of medical treatment and long term, insurance is a more cost efficient option to ensure you are able to afford the treatments required and to have a monthly income to cover your living expenses. ElderShield – Upgrade, Opt Out or Do Nothing? If you are interested to learn more about what to do with your ElderShield, you can read this article or download this guide to ElderShield Supplements here. If you want to know more about ElderShield or any other enquiries, you may contact me through whatsapp, schedule an appointment with me or fill up the form below and I will get back to you as soon as possible.